Not all of my anti-ageing treatments start on the outside of your body. I believe that a balanced level of hormones helps to manage the ageing process. Which means tackling the problem of ageing from the inside out. As we age our all-important growth hormone naturally decreases, resulting in less skin elasticity, slower recovery time from injuries, brittle bones and less muscle. However, it is possible to help kick start your glands so that they secrete more growth hormones, and that’s why I’ve created YOUTH – an all-natural hormone stimulator in an easy to take supplement. YOUTH combats the signs of ageing from the inside out. It’s a unique formulation of amino acids and marine plant extracts which help your skin look fresh and radiant, plus you’ll sleep better, feel stronger, heal faster and notice a significant increase in your energy levels. So why are amino acids so important? Well they’re in every cell in the body, as we age the body becomes less effective at extracting these key nutrients and the hormones we produce are of a poorer quality. YOUTH contains Arginine, Glutamine and Lysine which all help stimulate both the levels and quality of the hormones which counter the effects of ageing. So what makes YOUTH different to other anti-ageing supplements on the market? Well most contain many different ingredients but in small amounts. With YOUTH, I concentrated on the four major ingredients I know to be vital to anti-ageing – and at maximum amounts to increase results. In short, I left out all the fluffy stuff and concentrated on what will actually work! I wanted a good product, not just a good looking label! Taken regularly YOUTH will help you look and feel years younger. I estimate that (taken as directed) you should begin to notice a difference in four to six weeks. Plus the results are cumulative, so keeping on taking them maintains and improves the effect. If you don’t want to just take my word for it, I’ve received great reviews in the press so take a look for yourself in my press cuttings section. A recent test in Psychologies magazine made YOUTH ‘Best for Skin’ with the tester saying “My skin looks plumper, brighter and clearer”. The actress and comedienne Helen Lederer has also raved about YOUTH, take a look at her blog post. 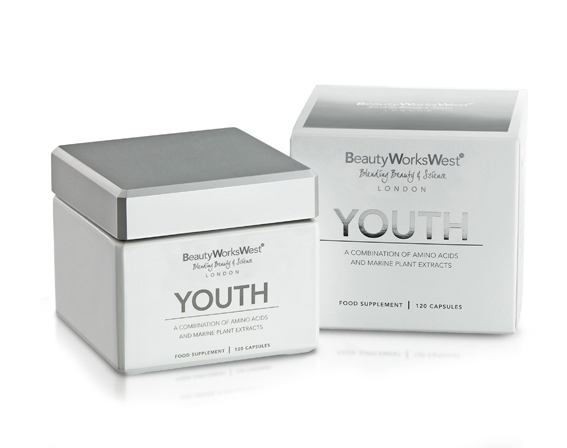 You can order YOUTH from Beauty Works West. If you’ve got any questions about YOUTH, or any of my other work you can comment on this blog post, email me at drsister317@gmail.com or tweet me @DrDanielSister. I look forward to hearing from you. Previous postSo just what is a wrinkle?